Welcome to the KC Kids Unite podcast! A space where communities and the voices of our youth are celebrated. In this episode we go inside Jana Holt's classroom in the Park Hill School District to hear what her students have to say about community, being a part of one, and why it's important to invest in something bigger than yourself. Prepare to be inspired! This episode provides a daily overview of the week 3 curriculum for KC Kids Unite where students ask themselves where they are going, and how sharing their personal stories about community and identity might raise awareness of the issues of marginalization and help others find the courage to raise their voices too. During this week students are encouraged to reflect and answer the question, "Who am I?" In so doing the peel back the layers of their identity and explore beauty beyond its surface level narrative projected through media and marketing. This episode overviews the framework and curriculum of the KC Kids Unite Project, focusing specifically on Week 1. 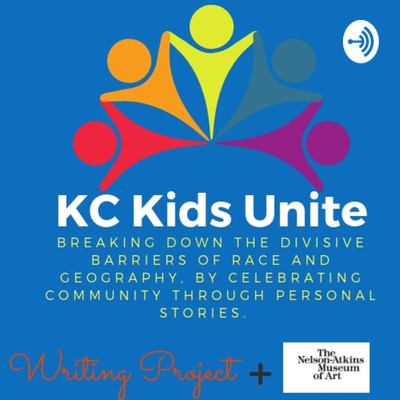 In this episode, listeners will learn about the work of KC Kids Unite, a community-based project working to unite elementary and middle school students from historically marginalized and isolated communities through art, literacy, and youth activism. This episode takes you inside Kansas City Missouri's racial history and its continual impact on our communities today.